Although the manufacturers are mostly cautious about handling their confidential documents, but still the leaks of their important documents might blow off their mind. This time it’s the turn of Fujitsu, whose confidential road map has been leaked. 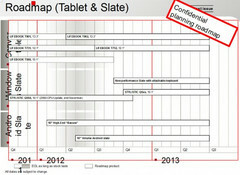 This roadmap shows several new items which include two Android Slates along with a Windows 8 Slate. 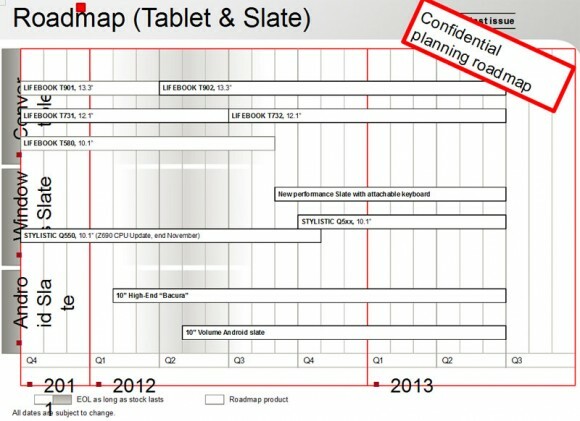 According to the roadmap Fujitsu might have 4 tablets planned for release in 2012. Among these devices the first one is called as the Bacura which is a 10inch High-End tablet. This device will be powered by Android and might be released in the market with another model called a Stylistic tablet, which was in the news earlier this year. The Stylistic tablet which is now named as Q5xx is expected to be a 10.1inch Windows 8 tablet rather than being another Android tablet in the market. There is another 10-inch Volume Android tablet about which we don’t have much information till now. This tablet was not heard of earlier other than from this leak, but it is expected to be released by the second quarter of this year. The roadmap also reveals that a new performance Slate with attachable keyboard is also set for release by the third quarter of this year which will run on both Android and Windows devices. Apart from all these tablets the roadmap also says that new convertible devices from Fujitsu called the Lifebook T902 with a 13.3inch display and Lifebook T732 with 12.1inch display might also get released in the coming months. These devices are mainly powered by 3ed Generation Intel Core Ivy Bridge processors and will currently be powered by Windows 7 platform. However after the release of Windows 8 platform these devices are expected to be upgraded to Windows 8.